Highlighted artwork: "We Reap to Share"
Our sincere thanks to the Durdin-Robertson family for their generosity in allowing the works of Lawrence Durdin-Robertson to be freely accessible to all our members. 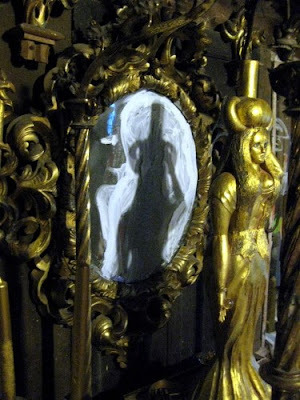 "A Priestess of Isis here in Avalon, Celia, asked me how my brother and I prepared candidates for Ordination and other Initiations. 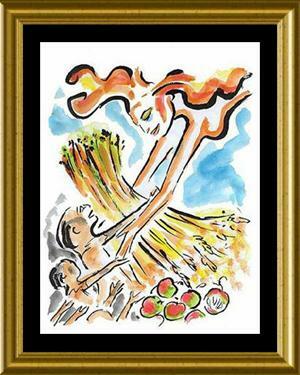 "Our essential aim for any Candidate was to receive direct revelation of the real existence of the Goddess. This we achieved through the Candidate developing psychic and spiritual awakening through trance experience and dream interpretation. Development of the Kundalini was all important for receiving the direct flow of energy through the body. "The Candidate was required to have a practical way to care for others through nature, social work, care for animals or the environment. "Practice of the Arts and Crafts was necessary for each Candidate to develop his or her unique gifts. Lawrence and myself gave our sessions for eight day periods. We would assemble in the library in the morning and each person was required to read a paper on some relevant subject to FOI. In the afternoons, we made pilgrimage to a sacred place to cooperate with the local energies. "At 6.00 p.m. we would assemble to experience magical journeys of the soul, where each person would report on what they received spiritually. Here, some found the gift of Oracle, others of Healing and Counselling. We accepted the equality of Teacher and Candidate, demanded no violation of their private lives or asked for any binding vows. When we felt that the Candidate was accepted by the Goddess and her Consort the God, we would then give the Rite of Rebirth, followed by Ordination in our Temple of Isis in full ceremony. 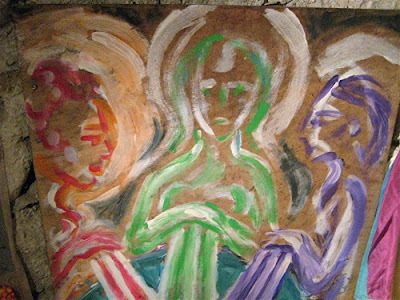 The new Priestess or Priest, in our experience, received a full flow of divine energy. They then, as was the custom of the ancient Priesthood, gave their Blessing to the world, with a declaration of their future spiritual intent." 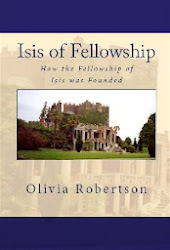 I am so happy that my niece Cressida Pryor is my successor in the spiritual and ethical work of the Fellowship of Isis. We need one single centre for registration of membership and centres (Lyceums, Iseums, Priories and Groves) which should be Clonegal Castle. Cressida has offered to be the custodian of the register. New members may register with her and must sign that they agree to the Manifesto. No member has the right to control another. There are no subscription fees, membership will always continue to be free. I feel my brother is with me as the Fellowship of Isis goes back to basics. Cressida is the niece of my brother Lawrence Durdin-Robertson and Pamela Durdin-Robertson. Registration to the Fellowship of Isis, and registration of centres may be made via my email. (zenziallink@hotmail.com) All must agree to the Manifesto. Please put ‘FOI’ in the title bar of any emails. Additional from Olivia: "Cressida is responsible only for registration and not new membership." Received from Olivia Robertson in London via Caroline Wise. 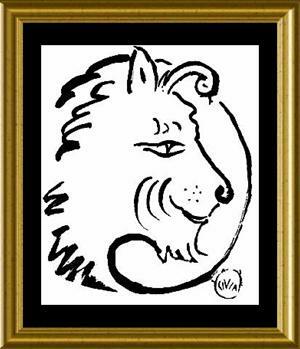 Happy Sun in Leo! Above is the Shrine of Leo in the Temple of Isis at Clonegal Castle. 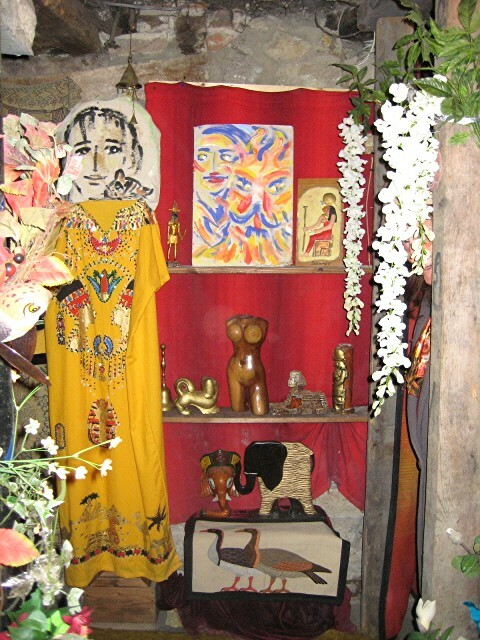 This shrine is found to the right of the Shrine of Cancer and both are located in the passageway outside of the Cave of the Mothers. 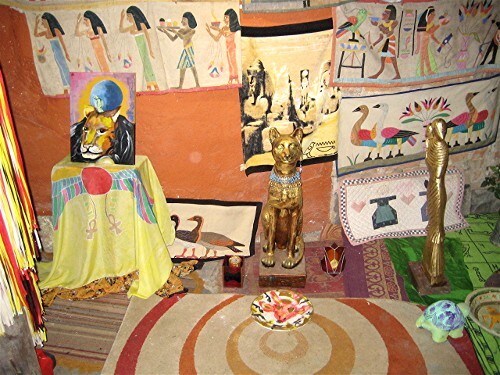 Shrine of The Anthrosphinx of Sekhmet, Bast, and Ra. From Caroline: Olivia has asked me to share the basics of my Priestess training. I have been overwhelmed by the needs of my friends the Hopi, Mayans, and Polynesians and other Native American peoples both North and South to save their whole life-style from well meaning but disastrous intervention. Now at last the Divine Command of the Earth Goddess has been heard as Druidess Caroline Wise was summoned to see Her Excellency the Bolivian Ambassador to London to help the Earth Goddess and the indigenous people. The Ambassadress has said we are five minutes to midnight to saving the earth, and that the earth goddess Patchamama is now officially recognised by the Bolivian government. If we want to help, each of us can light a candle to the Earth Goddess that we may perform her Divine Will to save the Earth. Not our will, her will by forming a network of lights around the earth. I was very honoured to be asked to a meeting at the Bolivian Embassy by the Ambassador to Britain Maria Beatriz Souviron to discuss the summer solstice significance at Stonehenge, and the goddess. I was also asked to describe our own beliefs in the Fellowship of Isis. I told her about our work in the Druid Clan of Dana and the Noble Order of Tara. Vivianne Crowley represented Wicca. Please see my report in the latest Isian News. (http://www.isiannewsfoi.org/) The ambassador said we are five minutes to midnight regarding the diminution of earth’s resources. She was aware that the pagan practice of the Bolivian indigenous people have similarities with modern ‘Western’ pagan practice. 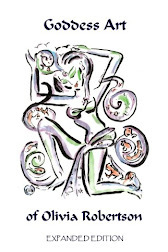 While I am aware that there are also differences that may not be in accord with my own practice, the important thing is that the Goddess has been officially recognised by a democratically elected government and this will lead to more recognition of the Goddess world wide. To help with this restoration of the Goddess, I sanction Olivia’s suggestion that we light candles and send the light forth to the indigenous people of the world. Five minutes to midnight on any day convenient to you would be a good time to do this; if this is not possible, then any time could be symbolic of ‘five minutes to midnight’. 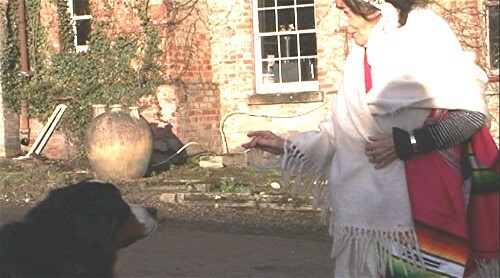 Photo of Olivia Robertson and Otto, the the Burmese Mountain Dog, by Dennis Murphy of Logic Reality. We are offering these booklets in PDF format first, and will then work on providing them in HTML format as well.